Lina’s Dream together with Diane’s Lingerie and CTV are very pleased to support the Canadian Breast Cancer Foundation – BC/ Yukon Region (CBCF) in launching the next phase of the Don’t Forget to Check campaign. 1. Check their breasts regularly. 2. Know how their breasts normally look and feel. 3. If they notice any changes, see a doctor. Through research, it was identified that much work was needed when it came to women age 25-39 and what they knew about breast cancer, and breast health. These women are not yet part of the Screening Mammography Program’s target audience (age 40+), but are still at risk of developing breast cancer. A significant research study was conducted with Vision Critical, a division of Angus Reid Public Opinion. From November 2 to November 5, 2012 they conducted an online survey among 403 randomly selected British Columbian women aged 25 to 39. The research determined what these women knew about breast health and breast cancer, and the mediums that they identified as the best way to deliver messaging in a memorable way, including television messages, washroom posters and radio ads. The research determined that whereas women in this age group had a good grasp as to what was fact or fiction when it came to breast health and cancer, there were a still a significant number (on average about 1/3 of respondents) who said that they were not sure about a number of breast cancer/health statements presented to them. 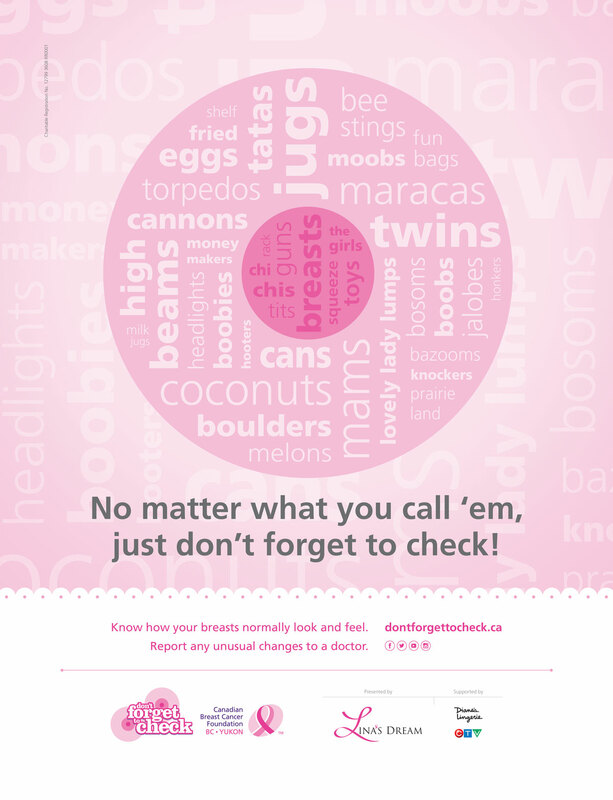 Therefore, this phase of the Don’t Forget to Check campaign was born, so that these women can be sure about what they should, or should not be doing to ensure their breast health today, and tomorrow. With generous funding from Lina’s Dream, Diane’s Lingerie CBCF launched Don’t Forget to Check for the 25 – 39 age group in February, 2014 along with the strong support from CTV and reporter Mi-Jung Lee, who bravely shared her journey with breast cancer. The Peer Match Program is a free and confidential telephone service that all Canadian residents ages 18 years or older can access. Anyone who has been diagnosed with cancer or is caring for someone with cancer is welcome to use the service. The program connects callers with a trained volunteer who has gone through a similar experience. Our volunteers are cancer survivors or are caregivers with a wide range of cancer experiences and life stories. While our volunteers will not give medical advice, they will share insights and ideas for coping with cancer. Last year, more than half of the callers in BC had breast cancer, making it the most commonly matched cancer type. The majority of clients who access Peer Match are women, comprised mainly of people undergoing treatment or waiting for treatment. Clients often report that using the service helps them to feel less alone, less anxious and better able to cope with their situation. They also report seeking additional information, engaging in self-care and having meaningful conversations with others after using the service.